Starring: Ryan Reynolds, Samuel L. Jackson, Elodie Yung, Gary Oldman, and more. ANNNDDDD I!!!!!!! WILLL ALWAYS LOVVVEEEEEE YOUUUUUUUUUU!!!!…. Errr, wait… Wrong movie. Whatever. HEY GUYS! Been a little bit and as of this posting date, I am a bit behind on my movie reviews due to my lil vacation I went on but alas, I HAVE RETURNED. And what a hot piece of material to return with. Here we are with a review on the Ryan Reynolds and Samuel L. Jackson led action comedy film, ‘The Hitman’s Bodyguard’. I have been so hyped for this movie for so long. I love these two leads and every element of this film was just perfect from my early speculation. Now it is time to see if it lived up to the hype. As expected and as the hype led me to believe, ‘The Hitman’s Bodyguard’ was wild and hilarious fun all the way around. Simply put, tagging Ryan Reynolds and Sam Jackson together in an R-Rated, no holds barred film is a formula fit for entertaining success. The two radiated the partner chemistry from the moment the two got together. A duo of sarcastic, rude, idgaf attitudes that carried throughout the entire film. I honestly believe that I laughed with every passing moment that the two were on screen together. If you love these actors, you will love the two of them together even more. Beyond the sheer comedy that Ryan and Sam brought to the film, this was everything you could predict from watching the trailer. Patrick Hughes gives a bloody and violent yet hilarious action comedy that follows the typical procedure of many of its predecessors, yet the film presents a few moments of enlightening outlooks concerning the characters and their moral compasses. So if there was anything I could say negatively about the film, it is that its nothing special when it comes to the genre. The quality is fueled by the performances of its stars yet it is just another R-Rated action comedy that we have seen variants of before. Chaotic, frantic, and foul-mouthed fun, ‘The Hitman’s Bodyguard’ is the perfect piece of film for any fan of over the top violent action comedies. It is hilarious and wild fun. 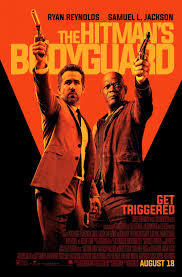 Fans of Ryan Reynolds and Sam Jackson will easily be satisfied by their performances. I mean, what is not to like of Ryan playing Deadpool without the costume? Check this movie out, folks. It is one of those movies that I had an incredible amount of fun watching in theaters. Posted in 2017 Movies, Movie Review.Tagged Elodie Yung, Movie Blogger, Movie Reviews, Movies. 2017, Patrick Hughes, Ryan Reynolds, Samuel L. Jackson, The Hitman's Bodyguard, Tom O'Connor.